In his testimony to the Joint Committee on March 12, Gov. Ritter began by discussing the difference in dynamics and landscapes between Nevada and Colorado before noting common themes – thoughtful leadership and a desire to provide equitable economic opportunities. Gov. Ritter reminded policy skeptics, who claim that policy isn’t necessary for market growth, that Colorado initially passed a 30% renewable portfolio standard (RPS)—ambitious at the time—only for the state utility to surpass the goal before ultimately setting its sights on zero-carbon electricity by 2050. That initial policy, Gov. Ritter says, sent the right signals to the business community to help reach the state’s goals, and beyond. AEE forecasted two energy sectors primed for growth: transportation electrification and renewable energy, through increasing Nevada’s RPS. The transportation sector in Nevada makes up 33% of the energy consumed in the state. This presents a significant market opportunity, given declining costs of electric vehicles (EVs) and increasing EV awareness and availability. 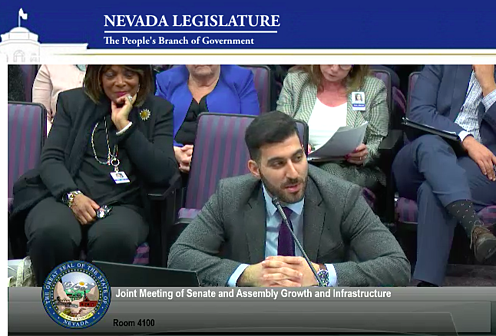 As for renewable energy development, AEE highlighted how advanced energy has been an economic boon for Nevada’s urban and rural communities, as the industry has now created more than 25,400 advanced energy jobs across the state. Aided by strong RPS passed in 2009, the Governor’s Office of Energy has successfully implemented a tax abatement program for renewable energy development. This program has led to 41 projects being developed, employing more than 8,000 Nevadans in construction jobs with an average wage of $41.70 per hour. In order for the state to build on this success, delivering economic growth and diversifying its energy portfolio, lawmakers should consider, once again, increasing the RPS to 50% by 2030, as was proposed in Sen. Chris Brook’s SB358. Now’s the time to double down on investing in these cost-effective technologies that not only create homegrown jobs and diversify the state’s energy mix, but also ensure customers benefit from affordable energy.